This Month: Pirates, Parties, and Plunder! YARRRR! It's high time we return to the open seas, and this month, we're doing just that! Join us as we celebrate Talk Like a Pirate Day, Aranx's birthday, and face off against Jaaku, the Shogun of Shadows in the finale of our "Return to Yokai" storyline. Back to School AC Bonus: September 1st - 7th: Get up to 50% more bonus ACs! Plus... 10th Upholder begins on September 28th! 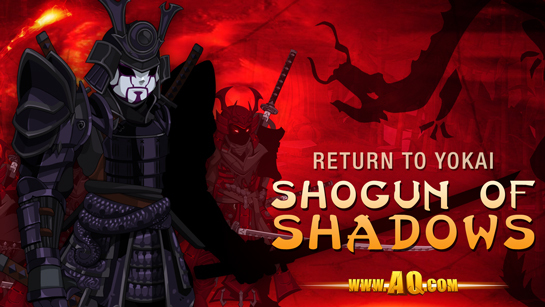 The Shogun of Shadows Story continues this weekend! The story so far... One of Akiba's greatest enemies has returned to make war on Yokai Isle, and this time, he has a dark new ally. In the first conflict, Emperor Daisho fell in battle, leaving Princess Miko to rally the troops and defend her country from Jaaku, the Shogun of Shadows. This weekend... Empowered by an ancient artifact which enhances her Battle Priestess powers, you, Miko and her cohort head east to Jaaku's fortress. To get there, you must pass through the war-torn Heiwa Village. Once an idyllic town, its people must now fight to defend themselves from the ghosts spawned by the recent Shadow War. Their leader, Koro, offers a bargain - help them drive out the angry spirits, and they'll join you in your quest to slay Jaaku's 8-headed Shadow Dragon! 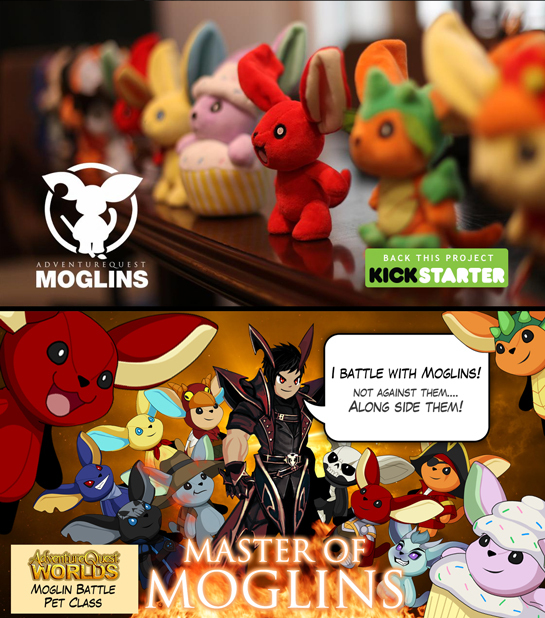 This year, one of our focuses has been on featuring a new roster of artists from the AQW community. We have so many talented artists out there, and the reception has been great. 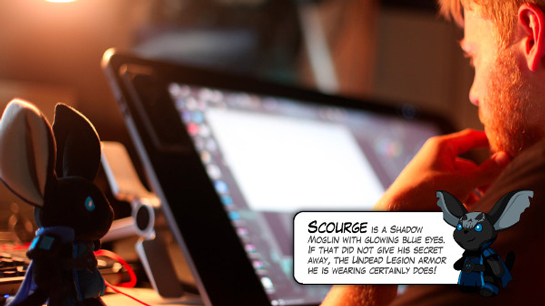 This weekend, we're featuring once more Yo Lae, an avid gamer (and Nulgath fan!) 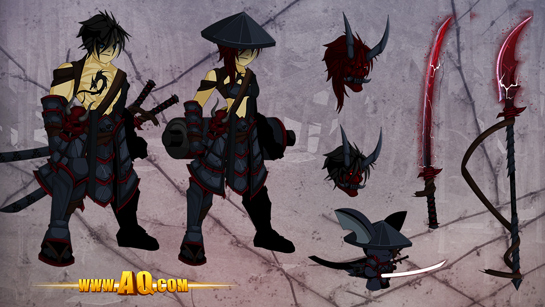 who's been a part of our community for years, and their Void Shogun armor set. If you're a fan of Nulgath's designs, it's time to break out your resources! And if you're not sure who Nulgath or the Nation are, here's your chance to learn. 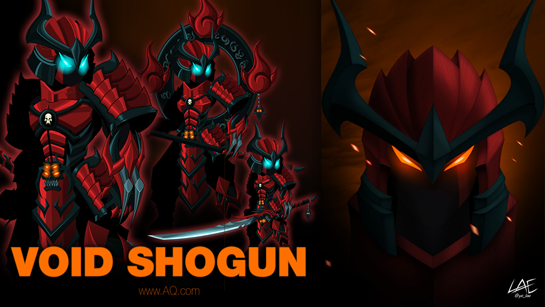 The Void Shogun's quest is based on one of the classic Nulgath quests, the Fiend of Nulgath. To accept the quest, you'll need to complete the release in /heiwavalley AND have the Void Monk of Nulgath armor from the merge shop in /quibblehunt. The 0 AC farmable Void Shogun set is a permanent addition to the game, so if you do not have time to farm this weekend, never fear. It will still be here when you do! 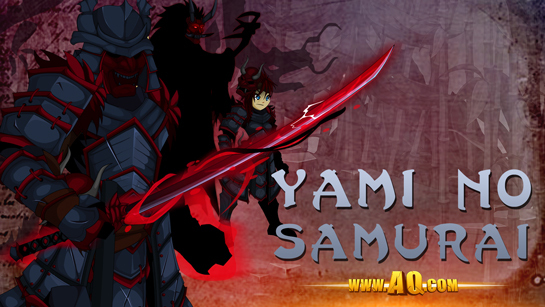 We're calling back to the fan-favorite "Shadow of Nulgath" set and with Yo Lae, created the Shadow Void Shogun set. Find the pieces of this set in your Featured Gear Shop until September 30th. September is coming soon, and that means... pirates and parties! YARRRRRR! 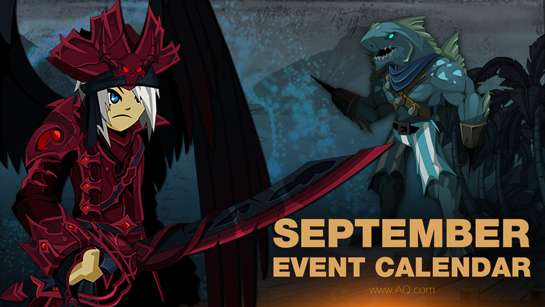 Every September, we celebrate Talk Like a Pirate Day and celestial AQW Artist Aranx's birthday. And this year, we're combining those two great themes to kick off a new monthly shop. Remember to keep your wings tightly furled when on deck to avoid getting tangled in the lines. But if the ship starts to sink, you'll be GLAD to have them as you fly to safety! The total cost to buy all of the gear individually is 4,000 ACs, so getting all the gear from the Celestial Naval Commander pack is a pretty sweet deal (you save 2,000 ACs). No, this is a different set. Just like the Flame Dragon Warrior, you can buy the entire set for one price on our site. You can ALSO buy the individual pieces in-game. This set will return EVERY September, so if you can't get it now, you'll have another chance in 2019, or 2020, or 2021, etc. Think of this like a carousel of gear. Every January, we'll have the January set. Every February, we'll feature the February set. The monthly upgrade bonuses will be separate and distinct bonuses. If this isn't the monthly upgrade bonus, what IS the bonus in September? 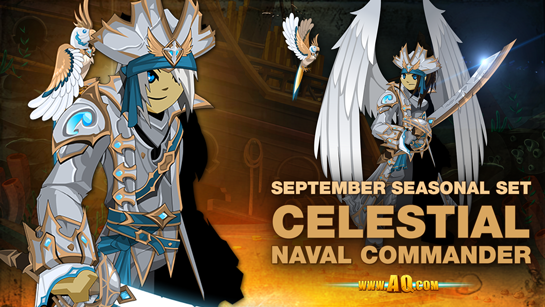 The next upgrade bonus releases on September 7th, and is the Infernal Naval Commander. It will go rare at the end of the month. You're in luck! Talk to Garek in Battleon. He'll be selling the individual pieces of each month's sets. Is this the same as Tier 1 for the new upgrade package? The seasonal sets are separate from the monthly upgrade bonuses, and won't impact the gear you get with them. The monthly upgrade packs will still have Tier 1 and Tier 2 options. Sir Icy Naval Tophat has returned to Barnaby’s shop. 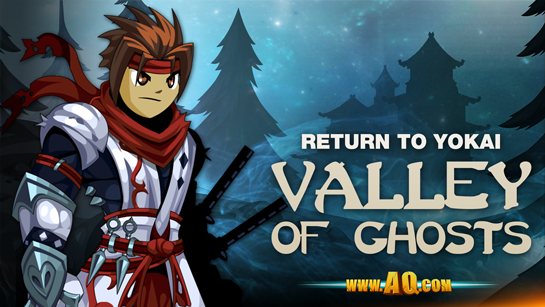 Shadow of the Past has been spoken to, and he will play somewhat nicer with the Memories of the Past quest now. Frogerion Pet is no longer so clingy, and has smoother hoppy. Twilly is no longer hoarding all the keys for himself. I told you he would see reason! Fire Dragon Scales, Fire Dragon Hearts, Pyritium Shards, Perfect Pyritium farming quests from Galanoth at /firewar have returned. Evolved Paragon Cape skulls now have blue eyes. Loyalty of the Dunes male shoulder is now CC. Horns of the Blood Sworn are placed where the artist wanted them to be. Dual 6th Betrayal Blade is the size Miltonius sent it as. This is because this part of the story actually begins with the quest “Hounds and Infernals and Imps, Oh My!” and ends with “YOU again!”. The tab display is broken up because of map changes during the story. Once you do finish these quests, the display will fix itself. Unfortunately, because of this, there really isn’t anything we can do to fix it while you are still in the process of doing the story. The AQW Wiki has some very helpful pages for assisting with the storylines. Hello everyone! It’s your favorite doggo here, Asuka! Recently we mentioned Oversoul and a lot of you seemed to be trying your best to get it up and running again. We appreciate your valiant attempts and decided to do something for you while you play, level and explore! 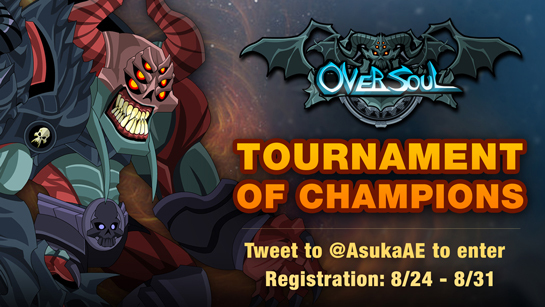 We are running an Oversoul Tournament for how much love and care you have been giving Oversoul from everyone in the community! We saw one generous player’s tournament D a w n and were inspired to do our very own as well! We are unleashing our latest tournament! There are very specific rules so be sure to listen closely if you’re interested in entering. What this means is there will be limited entry because of size and sheer numbers of possible entrants, but worry not! If this one is successful, we may do more in the coming future! There may be a ban list of specific characters! While we would love for you to use your fancy and awesome characters, we do know some are just..Really, really unfair to battle against most of the time. Custom decks may save one or two but we realize not everyone has this option. There will be a list available on my Twitter at @AsukaAE after this design notes has been posted and before the tournament heads under way. Worry not though! We will try to be as lenient as possible! This one will be tough but regarding to this please follow the criteria when entering for it. 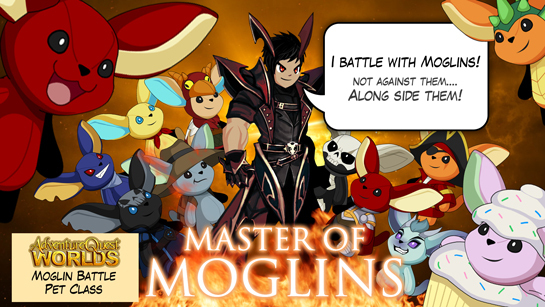 Make sure to pay attention to my Twitter at @AsukaAE to see your matchups of the day. You will have up to 24 hours to complete your duel. If you do not reach this requirement, you will be forfeited and your opponent will advance to the next round so please do your absolute best to pay attention! Since we cannot spectate actual matches, we will take screenshots of deciding duels. Please do not alter any images. If we find you to try and cheat or be dishonorable, we may disqualify you from current and future competitions at our discretion. Please be sure to send me the screenshots of the duel at the end. You can each send one, or you may decide between yourselves before the duel begins who will send it. Okay I read all the rules. Now, how can I enter? To enter, you will need to tweet to on Twitter with the following the criteria that will be needed at @AsukaAE with the following. Selection will be from both Twitter and the forums so please do enter. It will be a very first come, first serve kind of situation. Please follow this criteria when entering. It will allow me to help set up matches the best way I can. Failure to do so will be an unqualified entry. Will there be more tournaments or other things similar to this? If this goes all according to plan with a positive reaction and willingness to enter then this will very much so continue to happen! We love and appreciate all your efforts and hate for them to go to waste. So I can use anyone not on the ban list? You can! We will allow anyone from to use whatever they have that isn’t listed from level 1 to level 20. Be sure to use those legendary level 20s to good use! What’s a competition without some very useful prizes? We have something for 1st and 2nd place. I wish you all the best of luck in the tournament! The Shogun of Shadows Saga continues! Thousands fell during the War of Shadows... including Princess Miko's father, Emperor Daisho. This weekend, the Shogun of Shadows storyline continues in Yokai Isle. Now, Miko needs your help to protect her home. Battle alongside her as she hunts for the Shinrin Do, an enchanted item that will help her become the Battle Priestess and ruler she was always meant to be. 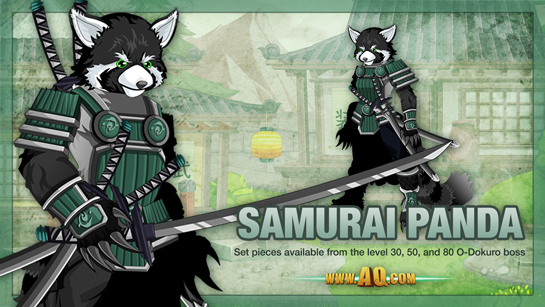 Plus, find the Akiban Defender set in the Yokai Rep Shop in /akiba! 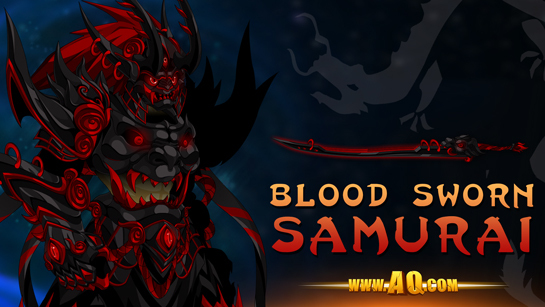 The Blood Sworn Samurai set is now available for AdventureCoins for all players. Members can purchase the set for gold. 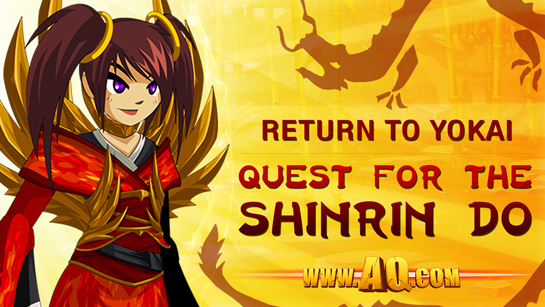 Talk to Ai No Miko in /shinringrove to find the pieces of the set in her Yokai Loyalty shop. Grab your inventories and check for treasure chests! 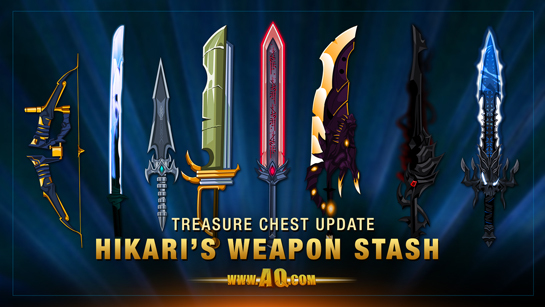 If you've got any laying around, talk to Twilly in Battleon because we have eight new weapons from AQW Community Artist, Hikari available from the Treasure Chest quest. Treasure chests have a less than 1% chance of dropping from ANY monster in the entire game. 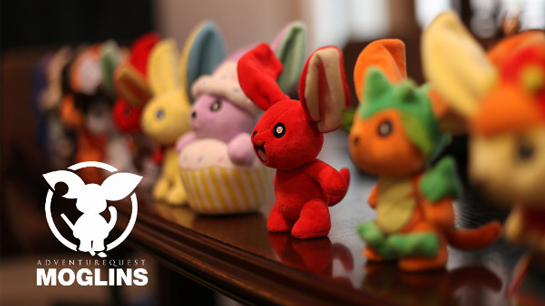 Each one contains one of dozens of epi1c Items that you can't get anywhere else. Members get two FREE Treasure Chest keys every month their upgrade is active, but all heroes can get you'll need a Treasure Chest key to try for a reward! The quest “Tea for Me” can be completed now, and the typo has been fixed. Side Phoenix Blade & Phoenix Blade on Your Back descriptions have been fixed. Skeletal Fire Mage has returned to BattleunderA from his vacation. Elissa Keelhaul has a shiny new back button. Or at least one that works now. The map Desoloth now has the replay button for all 3 Dragonplane cutscenes. Orochi has made an appearance now and chased Orocheevil out! Tiki Fun amour unusual CC bits removed. Prismatic SkyGuard Warrior female has found her skirt again. ArchPaladin Cape has been told to lighten up a bit. Were-Diver Morph foot fur now CC. No list this week, but we do need to make a general statement on the art of REALLY old items. When something is super old, like 2008-2009, generally we aren’t going to change the art. These items were made using a different style, that many players liked and still like. So they will remain as they are now. They will only be fixed if it is something that is actually broke, like pieces of the model not connected. This Weekend: Attack on Akiba! Undead Paladin Token has been given an increase in the drop rate. We’re still not going to confirm the rate though! Quibble has been convinced it’s vacation time. Mitsu Bishi’s shop has now opened. Book pages in Necrodungeon look better now. Cutscene “The End?” in Xancave names you now, and vanishing ring mystery has been solved. Cutscene “Mad Giant” character model now shows up. Knave1's quest "Weaken the Moya" no longer 1 time only. Typos! Are these just a given yet? Do I need to say it every week? Armor of War and Golden Armor of War now have skelly face. Herald of Stalagbite female skin is now CC. Vampire Armor/Class males having different eye scleras. The Vampire Class is a male only morph, so the eyes could be recoloured. The Armor is not a morph so needs to use standard eye colours. Shadow Blade Shinobi Hair shading. Hair can come in 3 “tones” or “shades”, dark, light or none. Helm shading is artist opinion. 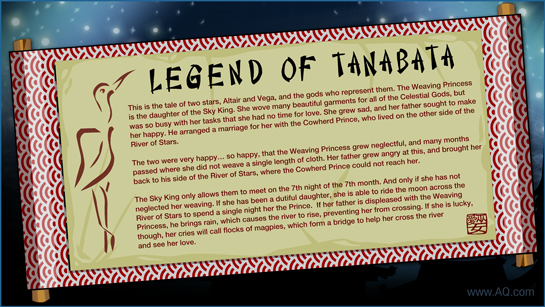 Gear up to celebrate Tanabata with Princess Miko's Star Festival in Yokai! 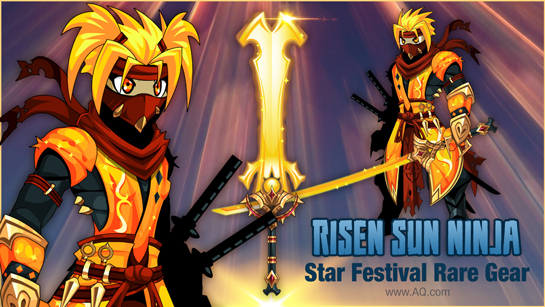 The Risen Sun Ninja armor set will be available from your Featured Gear Shop for AdventureCoins from August 9th to August 31st. 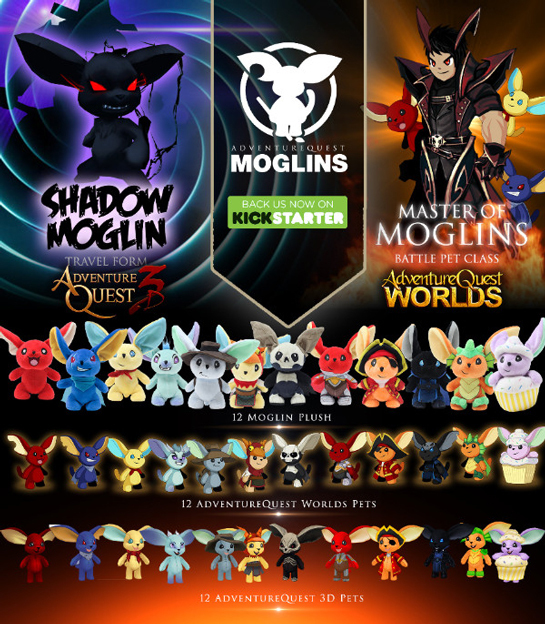 The Moglin Invasion is almost upon us! Help make it a reality. Happy Tanabata! This weekend, head to Yokai Isle as we celebrate the legendary Star Festival (known in our world as Tanabata). Battle across Lore to help grant Princess Miko's wishes for the Sky King's daughter come true, then stay for the /party presents! 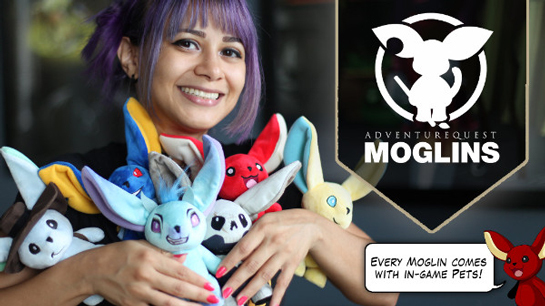 If you are a member in AQWorlds, head to the Akiba House Items Shop. You can purchase the Tanabata Fest Decoration for 7,777 gold. When you click on this item, you'll be taken straight to a permanent version of Akiba, where you can continue to farm for the 0 AC Moon Bow Ninja armor set! Are you one of the players who has stacks of 0AC tagged misc items clogging your bank and/or inventory? Have you been dreading the amount of time it will take to get rid of them, so you keep putting it off? And then more and more stack up? Then today is your lucky day! Live now on the PTR servers, you can delete 0AC misc items the same as any other item! Yes, you can delete the full stacks! We’ve also made sure that you cannot accidentally delete that treasured 0AC tagged sword/armour/helm/cape as well. This feature is only available on the PTR servers. That’s Testing Server and Testing Server 2. Head over today to get rid of all your unwanted stacks! Cutscenes at Yokai Boat play properly now. Infernal Caladbolg shrunk. Given growth potion. Golden Fury male no longer missing a bit of leg/hip. Thief of Hours and Lucky Knight have been de-pixeled (unpixeled?). 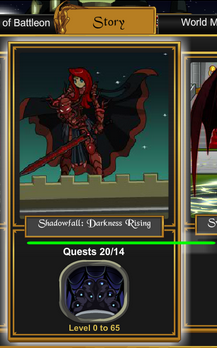 Darkblood Stormking Armor and Class art, male now has a Darkblood face & head. Tiki Fun female now holds weapons correctly. Helms in the Pirate Shop - these items are so old they are CC to hair. They use the darker shade to differentiate them from your hair. Royal Romance Garb male foot/leg connection. This is the way it was made. Keytar is not actually upside down. Facing left, you can read the name Soland in it. This is how it was intended to be. 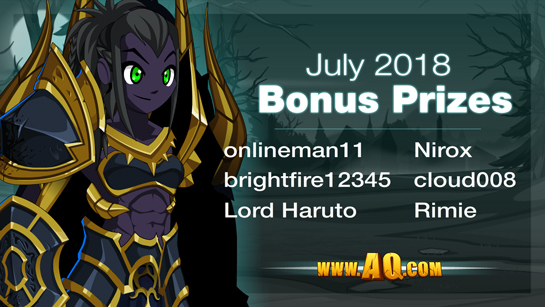 Congratulations to the July upgrade bonus prize winners! Winners received their Golden Ticket prizes earlier today. * Design Notes earlier this week listed multiple levels of the Kitsune boss. The location of those drops has been moved to the level 30, 50, and 80 O-Dokuro bosses. PS: the Frostval maps will close again on Friday, August 10th, and Quibble's Frostval shop will will not reopen until December. This is your last chance to cool off until Frostval! Upgrade with Select Membership or AdventureCoin Packages! 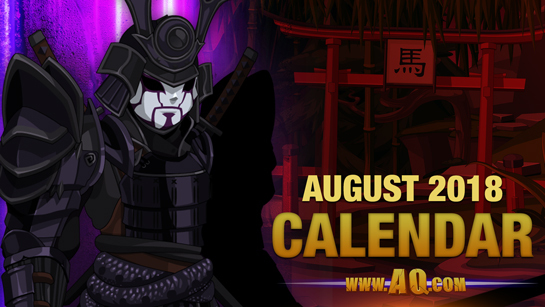 Starting this Friday, August 3rd, at 6 PM EST, unlock the Dark Shogun + Charged Ninja armor sets when you buy a 12 month membership or 12,000 AdventureCoin package. 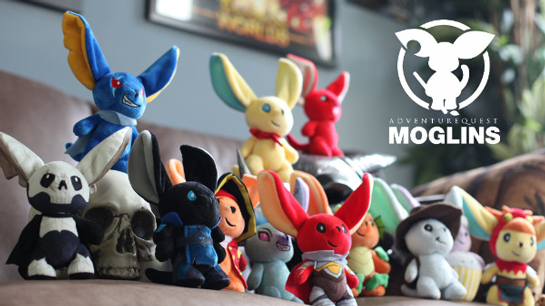 Plus, get up to 25% more bonus AdventureCoins with either a 12,000 AC or 5,000 AC package until August 31st, 2018! Get more gear and save more of your real-world gold with our largest upgrade packages! 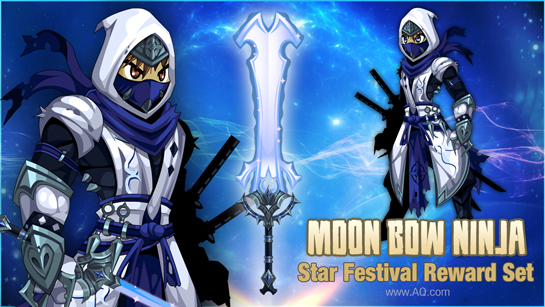 Unlock the Charged Ninja armor set when you buy any AdventureCoin or Membership package of $10 USD or more. The Dark Shogun and Charged Ninja bonus sets leave September 7th, 2018! We always like to give you more than you expect! Each month, when you purchase any upgrade package (either AdventureCoins or membership) 5 heroes will have a chance to win one of the bonus prizes listed below! Read this Design Notes post for more details! Return to Yokai Isle and fight to unlock new gear! 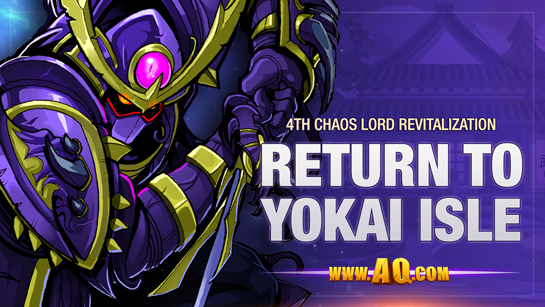 This weekend, head back to Yokai Isle as the team revitalizes the 4th Chaos Lord Saga in preparation for August's Shogun of Shadows 4-part storyline! We are also adding in high-level versions of the O-Dokuro saga boss for our experienced heroes. Take on the level 30, 50, and 80 versions of the O-Dokuro boss for a chance to get the pieces of the 0 AC Samurai Panda set.